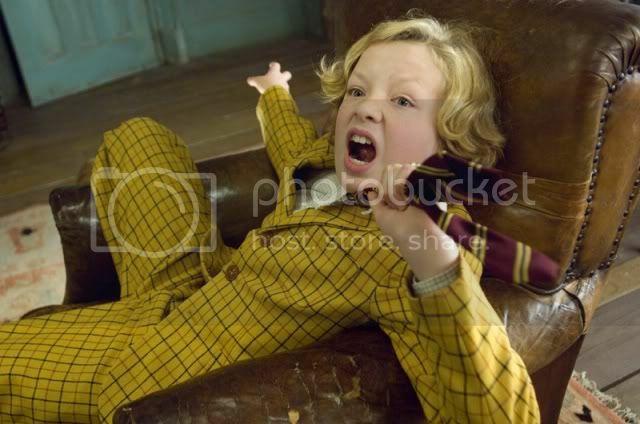 Not having seen Nanny McPhee, I knew little of what to expect from Nanny McPhee Returns. I knew that Emma Thompson was heavily involved with the production (she wrote and executive produced, alongside starring), and that Maggie Gyllenhaal was starring, so was mildly hopeful. Occasionally it pays off to be optimistic. The film revolves around Isabel Green (Gyllenhaal) and her young family. Her husband (Ewan MacGregor) is off fighting in World War II, and the English countryside is the safest place to raise children. Her oldest is Norman (Asa Butterfield, already well established with roles in The Boy in the Striped Pajamas and Son of Rambow). He’s followed by Megsie (Lil Woods), and then the littlest one, Vincent (Oscar Steer). They run a small farm, but it doesn’t produce enough to pay the bills. Isabel spends some time helping Mrs. Docherty (Maggie Smith) in her small shop in town. Aside from raising three children and a number of animals, she also has pressure from her brother-in-law, Phil (Rhys Ifans), to sell the farm. He doesn’t tell her so, but he needs the money to pay off some gambling debts. He’s threatened by the two best characters in the film, Topsy (Sinead Matthews) and Turvy (Katy Brand) a female duo with different body shapes and awful English teeth. Complicating things further are the cousins. 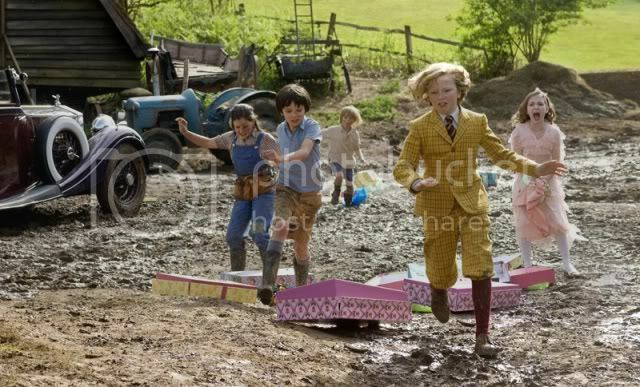 Ahead of schedule, cousins Cyril (Eros Vlahos) and Celia (Rosie Taylor-Ritson) leave the city for the safety of the countryside, arriving at the farm dismayed to discover that it is possible for an entire yard to be covered in mud. They are affluent and uppity, and far above the baseness and dirtiness of the farm. Naturally, their personalities clash significantly with Isabel’s three children, and a great deal of violence and ruckus ensues. Soon enough, Isabel is taunted by magical whisperings indicating that a visit from Nanny McPhee (Thompson) may be in her future. When she does show up at the Green’s door, Isabel is unsure how to deal with her aggressive compulsion to make the children better people. Her magical staff soon assuages any of Isabel’s fears, and soon the enlarged family is learning how to get along and help each other. The story is pleasant, and includes enough poop jokes for the children and enough serious discussion to appease parents. There is talk of war and death and loveless marriages, but the children focus on the magic in the world to get through it all. There are also a number of extremely silly sequences that might derail the film for all but the children in the audience. An extended sequence with pigs that can jump and fly and synchronize their swimming is absurd, and too cheesily magical to be effective. The film looks surprisingly good, with bright vibrant colors and sharp cinematography. The children and Isabel are endearing (and Gyllenhaal manages an adequate English accent), and Nanny McPhee’s bizarre ugliness is only partially disturbing. She teaches the children some important lessons about life, and they all have fun fighting for the farm and making it through the war. There are enough positive aspects for parents to be thankful that their children will like the film, and it is well enough made to engage all but the more cynical adults. Much of the film’s success probably ought to go to Emma Thompson, who managed to attract some high-quality British talent. McGregor makes a brief appearance, as does Ralph Fiennes as Cyril and Celia’s hardened war-general father. 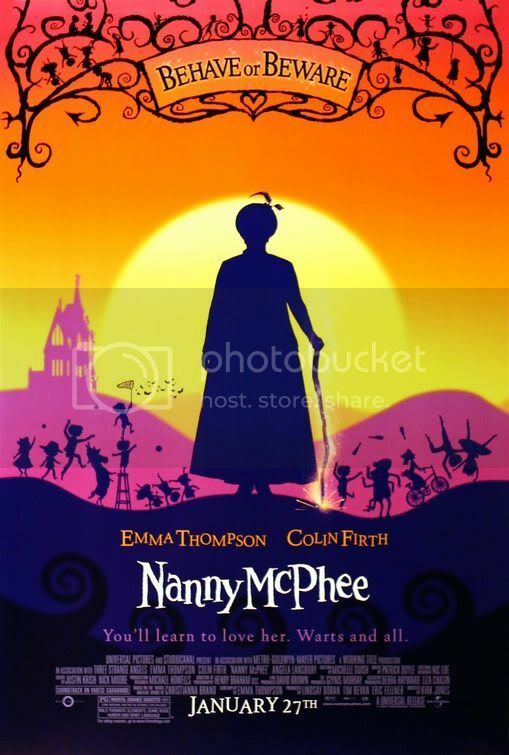 There is a great deal of silliness in the film, but with a production effort this strong and enough themes that will appeal to parents, Nanny McPhee Returns is surprisingly effective. This entry was posted in 1.5 pirate flags, 3 stars, Movie Reviews, N, Pirate Flag Rating, Star Rating on October 29, 2010 by Tim Irwin. transport operators, housing associations, and the private sector. thereby having expertise in the services that they offer.